Tennis and boating are also favorite pastimes for Hilton Head Plantation residents. A wide range of activities and amenities combined with low annual fees, make this established community especially attractive to second-home owners and primary residents alike. Send me more about Hilton Head Plantation! Two miles of sandy beach offer plenty of room to stretch out on. With more than 4,000 acres and two nature conservancies, Hilton Head Plantation is Hilton Head’s second-largest planned community. Sheltered between Port Royal Sound and the U.S. Intracoastal Waterway, the plantation offers two miles of sandy beaches on Port Royal Sound, and a marina to charter a boat or dock one of your own. Residents enjoy six miles of biking and jogging trails, central recreational facility, waterfront playground, four-star restaurant, community swimming pool, common gardening area, 12 tennis courts, plus four 18-hole golf courses. Close to schools and shopping. Send me more about Hilton Head Plantation! While amenities vary from one neighborhood to the next, all are within biking distance to a pool or a clubhouse via the intricate system of biking and jogging trails throughout the plantation. For details and pricing, see the real estate section below. Send me more about Hilton Head Plantation! Send me more about Hilton Head Plantation! While residential areas are gated and private, there is public access into the plantation that allows locals and tourists to visit restaurants, golf courses, and other public facilities. Hilton Head Island has nurtured and protected its lush environment, allowing visitors to view bottlenose dolphins at play, catch glimpses of loggerhead sea turtles, walk or horseback through forest preserves where families of deer are grazing, or watch seabirds over a sandy shore. Bluffton and Hilton Head offer a variety of unique shops and some of the nation’s most recognized retail chains. From chic boutiques to exclusive outlet stores, Hilton Head Island offers fashionable, fine-quality products in a fun and casual atmosphere. Hilton Head entertainment consists of the world-class Arts Center of Coastal Carolina that brings Broadway-caliber performances to the stage; two local Hilton Head art leagues and the much celebrated Hilton Head Symphony Orchestra. Several annual events bring visitors from all parts of the world to the Island. The International Piano Competition, The Concours D’Elegance Car Show, and the Verizon Heritage Golf Tournament are weeklong activities that provide residents unique opportunities to participate in world class programs. 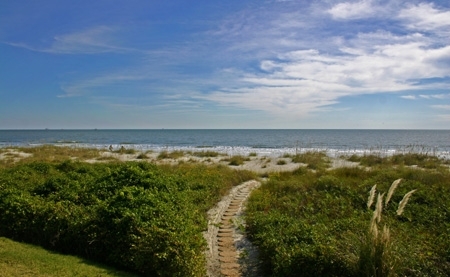 Send me more about Hilton Head Plantation!